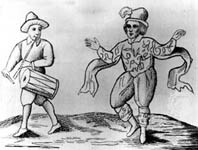 William Kempe was one of the most beloved clowns in the Elizabethan theatre. Records tell us that Kempe was an actor with Leicester’s Men on a tour of the Netherlands and Denmark in 1585-86. By 1593 Kempe was a member of Strange’s Men, and theatre-goers and fellow actors were beginning to recognize his comedic talent. Now finished with Shakespeare’s troupe and looking for another way to entertain the people of London, Kempe planned a wild publicity stunt. In 1600 he danced a morris dance from London to Norwich, almost 100 miles north. He wrote his own account of the event called Kempe’s Nine Days Wonder, and the picture above is from the cover of the original copy. Kempe returned to acting in 1601 when he left England to tour Europe. When he arrived home in 1602 he joined Worcester’s Men, but he disappears from the records shortly after. Some scholars conclude that he died from the 1603 plague in London – the year of one of the largest outbreaks of the disease during Shakespeare’s life. Adams, J.C. The Globe Playhouse: Its Design and Equipment. Barnes and Noble: New York, 1964. Smith, G. C. Moore, Litt.D., ed. The Life of Henry V. Blackie & Son Limited: London, 1937.